Word censoring is one of the most probably best features of the phpBB Forum platform and at the same time a mandatory for such type of platform where the users have the option to post content. It is a convenient way of controlling the content in order to reduce the amount of unpleasant contents on your Forum. In this tutorial we will show you how to use the Word Censoring feature in order to add words which should censored and of course how to edit and remove a censored word. In order to begin with this tutorial you will need to login into the Administration Control Panel of your forum and navigate to Posting>Messages>Word Censoring. This action will redirect you to the Word Censoring feature page where you will notice a single interface presenting a table view of your censored words. 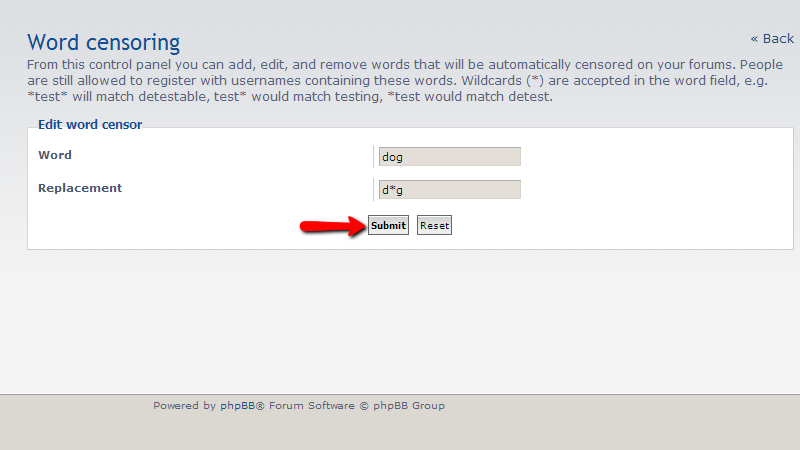 Most probably the first time you access this feature there will be no censored words as the phpBB platform does not include such with its default installation. In order to add a new word for censoring please use the Add new Word button located at the top right corner of the interface. Once you are ready with these fields you should use the Submit button in order to save the censored word and its replacement. Of course this will bring a successful message indicating that the censor has been successfully added. Returning to the previous page will land you on the Word Censoring page once again, however this time you will notice the newly added word in the table view of the interface. With this the process of censoring a word is completed. Now let’s edit the censored word and its censor of course. In order to do so you will need to click on the green icon under the Action column for the concrete censored word you would like to edit. This will bring the same interface you have used for adding a word with the two fields Word and Replacement which you should edit appropriately based on your needs and then using the Submit button to save the edit. Once you submit the forum the edit will be saved and you will be presented with a successful message indicating that. Finally let’s delete the censored word. In order to do so you will need to once again access the Word Censoring page so you can be presented with the table view of the censored words. Then you will need to click on the red icon located in the Action column of the table view for the concrete censored word you would like to remove from the list. This action will need to be confirmed at the next page and once you confirm it the censored word will be removed from the list. 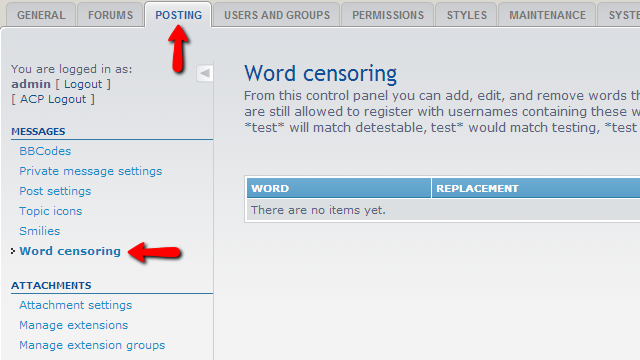 That is all about adding a censored words to your Forum!